I wanted to come up with an inexpensive and creative gift for my mother’s birthday. 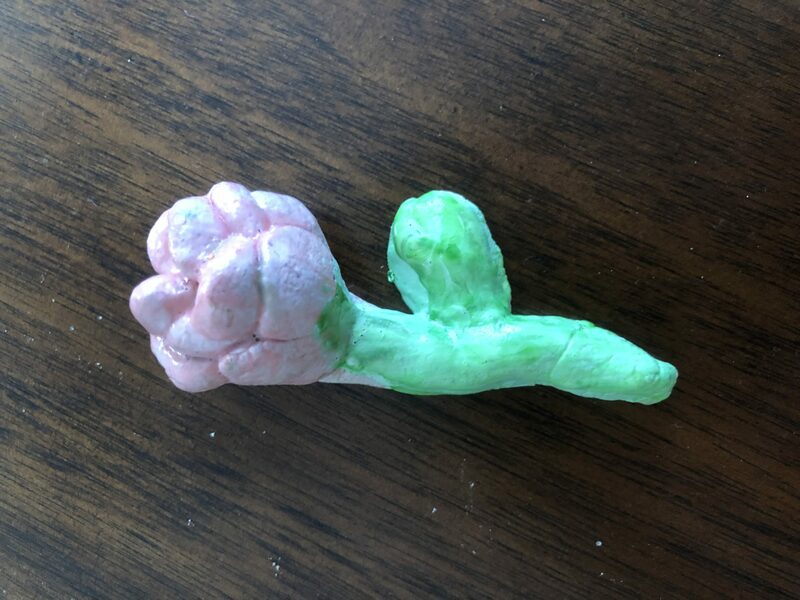 I also wanted Rosebud to be involved in making it so I decided to see what we could create with salt dough. 1. Mix salt and flour together in a bowl. If you are using powder paint to add coloring, you’ll want to mix it with the dry ingredients. I added the pinch of cinnamon at this stage for a hint of scent, but that is totally optional. 2. Gradually add the warm water and stir until dough forms. If you are using food coloring, add it into the water before mixing with the dry ingredients. 3. 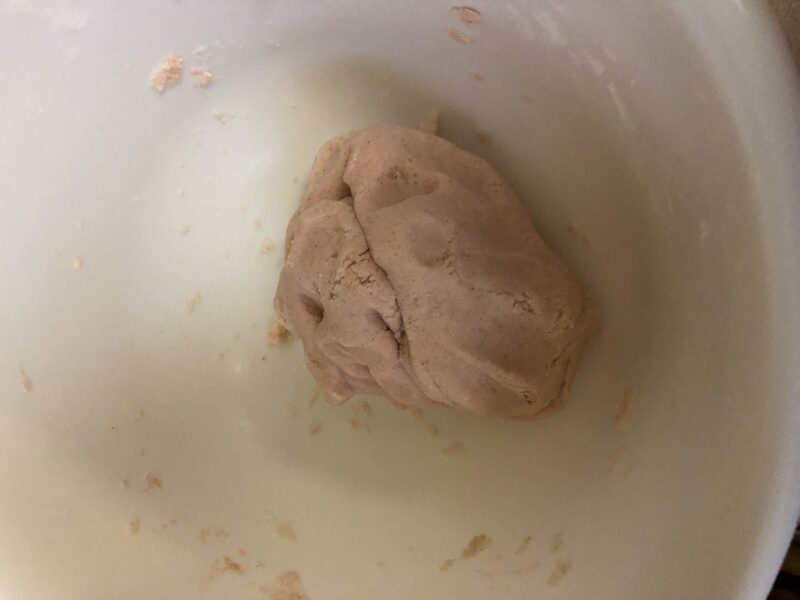 Once you have your dough, shape it into a ball and kneed for five minutes. the more you kneed, the softer it gets. 4. Time to have fun and see what you can create. 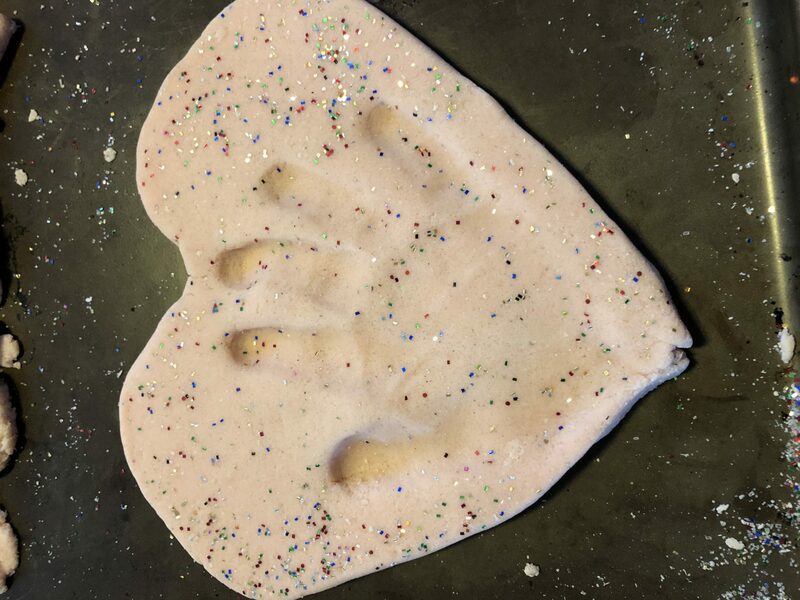 It took several tries, but I shaped the dough into a flat heart and Rosebud pushed her hand in the center to make the handprint. Trying to get a tired child to do something like this can be pure torture, but after the sixth try, we got our final product. 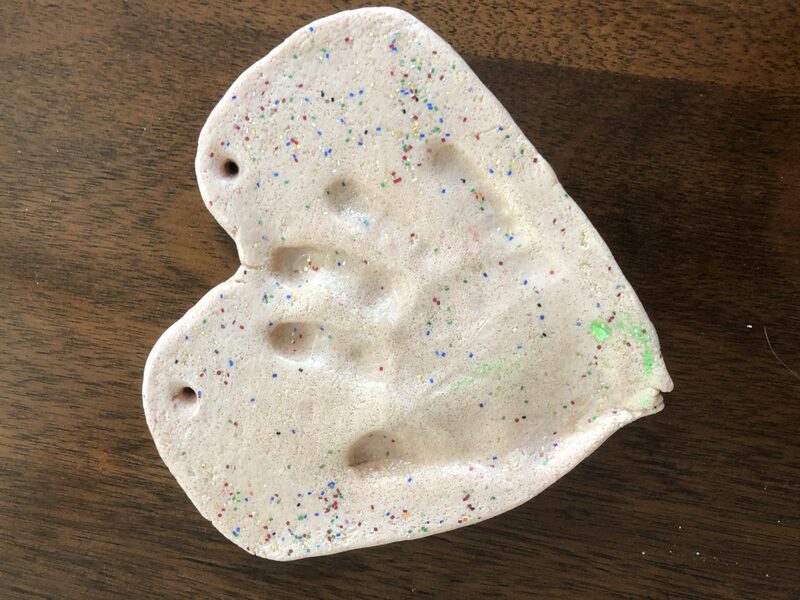 The other handprints were missing fingers, missing part of the hand itself or barely noticeable. To add some sparkle, I put some glitter on the heart. Finally, I poked two holes in the top so the heart can be hung as a decoration. I used a pencil to get good sized holes. Next, I worked on the small rose. I roled out a coil for the stem and then made the leaf and rose petals by hand. You role the dough into tiny balls, shape them like a fingerprint and then smooth and bend the pointy ends into the stem. I start out with the outside petals which are larger and then work my way into the smallest center petals. I baked the decorations for one hour at 200F and covered them with foil to avoid browning. The heart could’ve been baked a bit longer, but it air dried the rest of the way. When it was cool, I painted them. For the heart and flower, I mixed white paint with a tiny drop of red food coloring. For the stem and leaf, I mixed the white paint with some green food coloring. When the paint was dry, I covered it with a coat of modpoj. Rosebud was proud to give the birthday gifts and I was happy that we created something together. Have you made anything with salt dough? If so, what are your best creations? Thank you for stopping by and leaving a comment. Yes. The recipe is so easy and I love that the ingredients are not expensive at all. That’s always a plus in my book. What a cool and fun project to do with kids – I’ll have to try this with my niece!